Phase I of the Lower South Fork McKenzie River Floodplain Enhancement Project is underway. The Project will enhance habitat conditions within the lower mile of the river and restore connections to over 200 acres of floodplain. Contractors are currently collecting large wood for placement later this summer and preparing for floodplain reconnection. Prior to the start of in-stream activities, the Project will temporarily reroute the lower mile of the South Fork McKenzie River into a floodplain side channel. Project managers plan to begin the diversion in the late afternoon or early evening of June 26, 2018. Project activities, including the diversion, will continue until August 15, 2018. Project managers expect that the diversion may cause short-term turbidity impacts to the McKenzie River immediately downstream of the South Fork McKenzie River confluence. The Project will take several steps to minimize downstream turbidity impacts prior to the diversion. 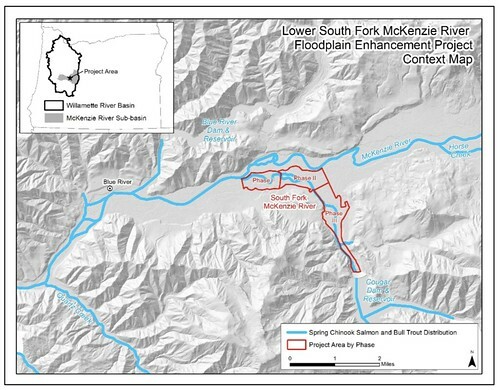 The U.S. Army Corps of Engineers will reduce flows in the South Fork McKenzie River to at least 275 cfs. Contractors will place large wood throughout the diversion side channel with helicopter in order to minimize disturbance to existing natural conditions. Large wood will slow flows and help reduce erosion. The diversion will take place over a period of several days in order to avoid scouring the floodplain side channel. The slow draw down will also allow for fish escapement prior to fish salvage operations within the current mainstem South Fork McKenzie River channel. Fish salvage operations will occur over a 3-4 day period and done in coordination with ODFW. Fish and other aquatic organisms will be re-located to locations outside of the project area. If you are interested in assisting with fish salvage operations please contact the McKenzie Watershed Council, (see contact info below). For more information, please contact project managers, Jared Weybright, McKenzie Watershed Council Executive Director, atjared@mckenziewc.org, 458-201-8150 (office), 541-505-0501(cell); or Kate Meyer, USFS McKenzie River Ranger District Fisheries Biologist,kmmeyer@fs.fed.gov, 541-822-7230 (office). This entry was posted in McKenzie River, Oregon Conservation News. Bookmark the permalink.